For other uses, see Sarajevo (disambiguation). Sarajevo (/ˌsærəˈjeɪvoʊ/; Cyrillic: Сарајево, pronounced [sǎrajeʋo]; see names in other languages) is the capital and largest city of Bosnia and Herzegovina, with a population of 275,524 in its administrative limits. The Sarajevo metropolitan area, including Sarajevo Canton, East Sarajevo and nearby municipalities, is home to 555,210 inhabitants.a Nestled within the greater Sarajevo valley of Bosnia, it is surrounded by the Dinaric Alps and situated along the Miljacka River in the heart of the Balkans. From top, left to right: Sarajevo panorama, Emperor's Mosque, Sarajevo Cathedral, Orthodox Cathedral, Sarajevo Library, Latin Bridge, and Sebilj. "Jerusalem of Europe", "Jerusalem of the Balkans", "Šeher, Rajvosa"
Sarajevo is the political, social and cultural center of Bosnia and Herzegovina, a prominent center of culture in the Balkans, with its region-wide influence in entertainment, media, fashion, and the arts. Due to its long and rich history of religious and cultural diversity, Sarajevo is sometimes called the "Jerusalem of Europe" or "Jerusalem of the Balkans". It is one of only a few major European cities which have a mosque, Catholic church, Orthodox church and synagogue in the same neighborhood. A regional center in education, the city is home to the Balkans first institution of tertiary education in the form of an Islamic polytechnic called the Saraybosna Osmanlı Medrese, today part of the University of Sarajevo. Although settlement in the area stretches back to prehistoric times, the modern city arose as an Ottoman stronghold in the 15th century. Sarajevo has attracted international attention several times throughout its history. In 1885, Sarajevo was the first city in Europe and the second city in the world to have a full-time electric tram network running through the city, following San Francisco. In 1914, it was the site of the assassination of Archduke Franz Ferdinand of Austria by local Young Bosnia activist Gavrilo Princip that sparked World War I, which also ended Austro-Hungarian rule in Bosnia and resulted in the creation of the Kingdom of Yugoslavia. Later, after World War II, the establishment of the Socialist Republic of Bosnia and Herzegovina within the Second Yugoslavia led to a massive expansion of Sarajevo, the constituent republic's capital, which culminated with the hosting of the 1984 Winter Olympics marking a prosperous era for the city. However, after the start of the Yugoslav Wars, for 1,425 days, from April 1992 to February 1996, the city suffered the longest siege of a capital city in the history of modern warfare, during the Bosnian War and the breakup of Yugoslavia. Sarajevo has been undergoing post-war reconstruction, and is the fastest growing city in Bosnia and Herzegovina. The travel guide series Lonely Planet has named Sarajevo as the 43rd best city in the world, and in December 2009 listed Sarajevo as one of the top ten cities to visit in 2010. In 2011, Sarajevo was nominated to be the European Capital of Culture in 2014 and will be hosting the European Youth Olympic Festival in 2019. The earliest known name for the large central Bosnian region of today's Sarajevo is Vrhbosna. The name Sarajevo derives from the Turkish noun saray, meaning "palace" or "mansion" (from the Persian سرای sarāy, "house, palace"). The letter "j" in the Bosnian language is equivalent soundwise to the English letter "y" as in "boy" and "yet". The evo portion may come from the term saray ovası first recorded in 1455, meaning "the plains around the palace" or simply "palace plains". However, in his Dictionary of Turkish loanwords, Abdulah Škaljić maintains that the "evo" ending is more likely to have come from the widespread Slavic suffix "evo" used to indicate place names, than from the Turkish ending "ova", as proposed by some. The first mention of name Sarajevo was in 1507 letter written by Feriz Beg. The official name during the 400-year Ottoman period was Saraybosna (Palace of Bosnia), and it is still known by that name in modern Turkish. Sarajevo has had many nicknames. The earliest is Šeher, which is the term Isa-Beg Ishaković used to describe the town he was going to build. It is a Turkish word meaning an advanced city of key importance (şehir) which in turn comes from Persian: شهر‎ shahr (city). As Sarajevo developed, numerous nicknames came from comparisons to other cities in the Islamic world, i.e. "Damascus of the North". The most popular of these was "European Jerusalem". Some argue that a more correct translation of saray is government office or house. Sarajevo is near the geometric center of the triangular-shaped Bosnia-Herzegovina and within the historical region of Bosnia proper. It is situated 518 meters (1,699 ft) above sea level and lies in the Sarajevo valley, in the middle of the Dinaric Alps. The valley itself once formed a vast expanse of greenery, but gave way to urban expansion and development in the post-World War II era. 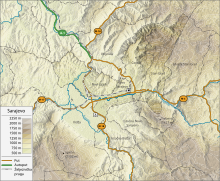 The city is surrounded by heavily forested hills and five major mountains. The highest of the surrounding peaks is Treskavica at 2,088 meters (6,850 ft), then Bjelašnica mountain at 2,067 meters (6,781 ft), Jahorina at 1,913 meters (6,276 ft), Trebević at 1,627 meters (5,338 ft), with 1,502 meters (4,928 ft) Igman being the shortest. The last four are also known as the Olympic Mountains of Sarajevo (see also 1984 Winter Olympics). The city itself has its fair share of hilly terrain, as evidenced by the many steeply inclined streets and residences seemingly perched on the hillsides. The Miljacka river is one of the city's chief geographic features. It flows through the city from east through the center of Sarajevo to west part of city where eventually meets up with the Bosna river. Miljacka river is "The Sarajevo River", with its source (Vrelo Miljacke) 2 kilometres (1.2 miles) south of the town of Pale at the foothills of Mount Jahorina, several kilometers to the east of Sarajevo center. The Bosna's source, Vrelo Bosne near Ilidža (west Sarajevo), is another notable natural landmark and a popular destination for Sarajevans and other tourists. Several smaller rivers and streams such as Koševski Potok also run through the city and its vicinity. A panoramic view of Sarajevo valley from "Yellow Bastion" (Žuta tabija) lookout, spring 2012. Sarajevo is close to the center of the triangular shape of Bosnia and Herzegovina in southeastern Europe. Sarajevo city proper consists of four municipalities (or "in Bosnian and Croatian: općina, in Serbian: opština"): Centar (Center), Novi Grad (New City), Novo Sarajevo (New Sarajevo), and Stari Grad (Old City), while Metropolitan area of Sarajevo (Greater Sarajevo area) includes these and the neighbouring municipalities of Ilidža, Hadžići, Vogošća and Ilijaš. The city has an urban area of 1,041.5 square kilometres (402.1 sq mi). Veliki Park (Great park) is the largest green area in the center of Sarajevo. It's nestled between Titova, Koševo, Džidžikovac, Tina Ujevića and Trampina Streets and in the lower part there is a monument dedicated to the Children of Sarajevo. Sarajevo has a humid continental climate (Dfb). Sarajevo's climate exhibits influences of oceanic zones, with four seasons and uniformly spread precipitation. The proximity of the Adriatic Sea moderates Sarajevo's climate somewhat, although the mountains to the south of the city greatly reduce this maritime influence. The average yearly temperature is 10 °C (50 °F), with January (−0.5 °C (31.1 °F) on average) being the coldest month of the year and July (19.7 °C (67.5 °F) on average) the warmest. The highest recorded temperature was 40.7 °C (105 °F) on 19 August 1946, and on 23 August 2008 (41.0) while the lowest recorded temperature was −26.2 °C (−15.2 °F) on 25 January 1942. On average, Sarajevo has 7 days where the temperature exceeds 32 °C (89.6 °F) and 4 days where the temperature drops below −15 °C (5 °F) per year. The city typically experiences mildly cloudy skies, with an average yearly cloud cover of 45%. The cloudiest month is December (75% average cloud cover) while the clearest is August (37%). Moderate precipitation occurs fairly consistently throughout the year, with an average 75 days of rainfall. Suitable climatic conditions have allowed winter sports to flourish in the region, as exemplified by the Winter Olympics in 1984 that were celebrated in Sarajevo. Average winds are 28–48 km/h (17–30 mph) and the city has 1,769 hours of sunshine. Air pollution is a major issue in Sarajevo. According to the 2016 World Health Organization's Ambient Air Pollution Database, the annual average PM2.5 concentration in 2010 was estimated to be 30 μg/m3 based on PM10 measurement, which is 3 times higher than recommended by WHO Air Quality Guidelines for annual average PM2.5. There are no recent direct long-term PM2.5 measurements available in Sarajevo and only estimates can be made from PM10, which is the less health-relevant than PM2.5. Real-time air quality data in the form of PM10, ozone, NO2, CO and SO2 by the Federal Hydrometeorological Institute. One of the earliest findings of settlement in the Sarajevo area is that of the Neolithic Butmir culture. The discoveries at Butmir were made on the grounds of the modern-day Sarajevo suburb Ilidža in 1893 by Austro-Hungarian authorities during the construction of an agricultural school. The area's richness in flint was attractive to Neolithic humans, and the settlement flourished. The settlement developed unique ceramics and pottery designs, which characterize the Butmir people as a unique culture, as described at the International Congress of Archaeologists and Anthropologists meeting in Sarajevo in 1894. The next prominent culture in Sarajevo were the Illyrians. The ancient people, who considered most of the West Balkans as their homeland, had several key settlements in the region, mostly around the river Miljacka and the Sarajevo valley. The Illyrians in the Sarajevo region belonged to the Daesitiates, the last Illyrian people in Bosnia and Herzegovina to resist Roman occupation. Their defeat by the Roman emperor Tiberius in 9 A.D. marks the start of Roman rule in the region. The Romans never built up the region of modern-day Bosnia, but the Roman colony of Aquae Sulphurae was near the top of present-day Ilidža, and was the most important settlement of the time. After the Romans, the Goths settled the area, followed by the Slavs in the 7th century. During the Middle Ages Sarajevo was part of the Bosnian province of Vrhbosna near the traditional center of the Kingdom of Bosnia. Though a city named Vrhbosna existed, the exact settlement in Sarajevo at this time is debated. Various documents note a place called Tornik in the region, most likely in the area of Marijin Dvor neighborhood. By all indications, Tornik was a very small marketplace surrounded by a proportionally small village, and was not considered very important by Ragusan merchants. Other scholars say that Vrhbosna was a major town in the wider area of modern-day Sarajevo. Papal documents say that in 1238, a cathedral dedicated to Saint Paul was built in the area. Disciples of the notable saints Cyril and Methodius stopped in the region, founding a church near Vrelo Bosna. Whether or not the town was somewhere in the area of modern-day Sarajevo, the documents attest to its and the region's importance. There was also a citadel Hodidjed north-east to Old City, dating from around 1263 until it was occupied by the Ottoman Empire in 1429. The Sebilj is a pseudo-Ottoman style wooden fountain in the centre of Baščaršija square. Sarajevo was founded by the Ottoman Empire in the 1450s upon its conquest of the region, with 1461 used as the city's founding date. The first Ottoman governor of Bosnia, Isa-Beg Ishaković, transformed the cluster of villages into a city and state capital by building a number of key structures, including a mosque, a closed marketplace, a public bath, a hostel, and of course the governor's castle ("Saray") which gave the city its present name. The mosque was named "Careva Džamija" (the Tsar's Mosque) in honor of the Sultan Mehmed II. With the improvements Sarajevo quickly grew into the largest city in the region. By the 15th Century the settlement was established as a city, named Bosna-Saraj, around the citadel in 1461. The name Sarajevo is derived from Turkish saray ovası, meaning the field around saray. Following the expulsion of Jews from Spain at the end of the 15th century, and the invitation from the Ottoman Empire to resettle their population, Sephardic Jews arrived in Sarajevo, which over time would become a leading center of Sephardic culture and the Ladino language. Though relatively small in size, a Jewish quarter would develop over several blocks in Baščaršija. Many local Christians converted to Islam at this time. To accommodate the new pilgrims on the road to Mecca, in 1541 Gazi Husrev-Bey’s quartermaster Vekil-Harrach built a Pilgrim's mosque for which it is still known to this day Hadžijska mosque. Under leaders such as the second governor Gazi Husrev-beg, Sarajevo grew at a rapid rate. Husrev-beg greatly shaped the physical city, as most of what is now the Old Town was built during his reign. Sarajevo became known for its large marketplace and numerous mosques, which by the middle of the 16th century numbered more than 100. At the peak of the empire, Sarajevo was the biggest and most important Ottoman city in the Balkans after Istanbul. By 1660, the population of Sarajevo was estimated to be over 80,000. By contrast, Belgrade in 1683 had 100.000, and Zagreb as late as 1851 had 14,000 people. As political conditions changed, Sarajevo became the site of warfare. In 1697, during the Great Turkish War, a raid was led by Prince Eugene of Savoy of the Habsburg Monarchy against the Ottoman Empire, which conquered Sarajevo and left it plague-infected and burned to the ground. After his men had looted thoroughly, they set the city on fire and destroyed nearly all of it in one day. Only a handful of neighborhoods, some mosques, and an Orthodox church, were left standing. Numerous other fires weakened the city, which was later rebuilt but never fully recovered from the destruction. By 1807, it had only some 60,000 residents. In the 1830s, several battles of the Bosnian uprising had taken place around the city. These had been led by Husein Gradaščević. Today, a major city street is named Zmaj od Bosne (Dragon of Bosnia) in his honor. The rebellion failed and for several more decades the Ottoman state remained in control of Bosnia. The Ottoman Empire made Sarajevo an important administrative centre by 1850. Baščaršija was built becoming an old bazaar and a historical and cultural center of the city in the 15th century when Isa-Beg Isaković founded the town . The word Baščaršija derives from the Turkish language. The Latin Bridge was the site of the assassination of Franz Ferdinand. Austria-Hungary's occupation of Bosnia and Herzegovina came in 1878 as part of the Treaty of Berlin, and complete annexation followed in 1908, angering the Serbs. Sarajevo was industrialized by Austria-Hungary, who used the city as a testing area for new inventions such as tramways, which were established in 1885 before they were later installed in Vienna. Architects and engineers wanting to help rebuild Sarajevo as a modern European capital rushed to the city. A fire that burned down a large part of the central city area (čaršija) left more room for redevelopment. As a result, the city has a unique blend of the remaining Ottoman city market and contemporary western architecture. 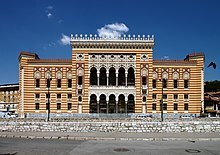 Sarajevo also has some examples of Secession- and Pseudo-Moorish styles that date from this period. The Austro-Hungarian period was one of great development for the city, as the Western power brought its new acquisition up to the standards of the Victorian age. Various factories and other buildings were built at this time, and a large number of institutions were both Westernized and modernized. For the first time in history, Sarajevo's population began writing in Latin script. For the first time in centuries, the city significantly expanded outside its traditional borders. Much of the city's contemporary central municipality (Centar) was constructed during this period. Architecture in Sarajevo quickly developed into a wide range of styles and buildings. The Cathedral of Sacred Heart, for example, was constructed using elements of neo-gothic and Romanesque architecture. The National Museum, Sarajevo brewery, and City Hall were also constructed during this period. Additionally, Austrian officials made Sarajevo the first city in this part of Europe to have a tramway. Although the Bosnia Vilayet de jure remained part of the Ottoman Empire, it was de facto governed as an integral part of Austria-Hungary with the Ottomans having no say in its day-to-day governance. This lasted until 1908 when the territory was formally annexed and turned into a condominium, jointly controlled by both Austrian Cisleithania and Hungarian Transleithania. In the event that triggered World War I, Archduke Franz Ferdinand of Austria was assassinated, along with his wife Sophie, Duchess of Hohenberg in Sarajevo on 28 June 1914 by a self-declared Yugoslav, Gavrilo Princip, a member of Young Bosnia. In response, many residents of Sarajevo organized riots against the Serbs, killing two and destroying their property. In the ensuing war, however, most of the Balkan offensives occurred near Belgrade, and Sarajevo largely escaped damage and destruction. Following the war, after the Balkans were unified under the Kingdom of Yugoslavia, and Sarajevo became the capital of Drina Province. The Academy of Fine Arts was originally built to serve as an Evangelical Church in 1899. After World War I and contributions from the Serbian army alongside rebelling Slavic nations in Austria-Hungary, Sarajevo became part of the Kingdom of Yugoslavia. Though it held some political significance as the center of first the Bosnian region and then the Drinska Banovina, the city was no longer a national capital and saw a decline in global influence. During World War II the Kingdom of Yugoslavia's army was overrun by German and Italian forces. Following a German bombing campaign, Sarajevo was captured on 15 April 1941 by the 16th Motorized infantry Division. The Axis powers created the Independent State of Croatia and included Sarajevo in its territory. Immediately following the occupation, the main Sephardi Jewish synagogue, Il Kal Grande, was looted, burned, and destroyed by the Nazis with assistance from a handful of local Bosniaks. Within a matter of months, the centuries-old Sephardi and Ashkenazi Jewish communities of Sarajevo, comprising the vast majority of Bosnian Jewry, would be rounded up in the Old Synagogue (Stari hram) and deported to their deaths in Croatian concentration camps. Roughly 85% of Bosnia's Jewish population would perish at the hands of the Nazis and the Ustaše during the Holocaust. 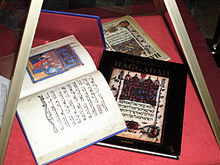 The Sarajevo Haggadah was the most important artifact which survived this period, smuggled out of Sarajevo and saved from the Nazis and Ustaše by the chief librarian of the National Museum, Derviš Korkut. On 12 October 1941, a group of 108 notable Bosniak citizens of Sarajevo signed the Resolution of Sarajevo Muslims by which they condemned the persecution of Serbs organized by the Ustaše, made a distinction between the Bosniaks who participated in such persecutions and the rest of the Bosniak population, presented information about the persecutions of Bosniaks by Serbs, and requested security for all citizens of the country, regardless of their identity. By mid-summer 1942, around 20,000 Serbs found refuge in Sarajevo from Ustaše terror. The city was bombed by the Allies from 1943 to 1944. The Yugoslav Partisan movement was represented in the city. In period February–May 1945 Maks Luburić set up Ustaše headquarters in a building known as Villa Luburić and used it as torture and execution place whose 323 victims were identified after the war. Resistance was led by Vladimir "Walter" Perić, who died while leading the liberation of the city on 6 April 1945. After the war, Sarajevo was the capital of the Socialist Republic of Bosnia and Herzegovina within the Socialist Federal Republic of Yugoslavia. The Republic Government invested heavily in Sarajevo, building many new residential blocks in Novi Grad Municipality and Novo Sarajevo Municipality, while simultaneously developing the city's industry and transforming Sarajevo into a modern city. Sarajevo grew rapidly as it became an important regional industrial center in Yugoslavia. Between the end of the war and the end of Yugoslavia, the city grew from a population of 115,000 to more than 600,000 people. The Vraca Memorial Park, a monument for victims of World War II, was dedicated on 25 November, the "Day of Statehood of Bosnia and Herzegovina" when the ZAVNOBIH held their first meeting in 1943. A crowning moment of Sarajevo's time in Socialist Yugoslavia was the 1984 Winter Olympics. Sarajevo beat out Sapporo, Japan; and Falun/Göteborg, Sweden to host the Olympic games. The games were followed by a tourism boom, making the 1980s one of the city's most prosperous decades. The Sarajevo Red Line, a memorial event of the Siege of Sarajevo's 20th anniversary. 11,541 empty chairs symbolized 11,541 victims of the war which were killed during the Siege of Sarajevo. The Bosnian War for independence resulted in large-scale destruction and dramatic population shifts during the Siege of Sarajevo between 1992 and 1996. Thousands of Sarajevans lost their lives under the constant bombardment and sniper shooting at civilians by the Serb forces during the siege, the longest siege of a capital city in the history of modern warfare. Serb forces of the Republika Srpska and the Yugoslav People's Army besieged Sarajevo from 5 April 1992 to 29 February 1996. When Bosnia and Herzegovina declared independence from Yugoslavia and achieved United Nations recognition, Serbian leaders declared a new Serbian national state Republika Srpska (RS) which was carved out from the territory of Bosnia and Herzegovina. The Serbian Army encircled Sarajevo with a siege force of 18,000 stationed in the surrounding hills, from which they assaulted the city with artillery, mortars, tanks, anti-aircraft guns, heavy machine-guns, multiple rocket launchers, rocket-launched aircraft bombs, and sniper rifles. From 2 May 1992, the Serbs blockaded the city. The Bosnian government defence forces inside the besieged city were poorly equipped and unable to break the siege. During the siege, 11,541 people lost their lives, including over 1,500 children. An additional 56,000 people were wounded, including nearly 15,000 children. The 1991 census indicates that before the siege the city and its surrounding areas had a population of 525,980. When the siege ended, the concrete scars caused by mortar shell explosions left marks that were filled with red resin. After the red resin was placed, it left floral patterns which led to them being dubbed Sarajevo Roses. Various modern buildings now occupy Sarajevo's skyline, most significantly the Bosmal City Center, BBI Centar, Sarajevo City Center and the Avaz Twist Tower, which at the time of its building was the tallest skyscraper in former Yugoslavia. Recent years have seen population growth as well as increases in tourism. In 2014 the city saw anti-government protests and riots and record rainfall that caused historic flooding. Sarajevo is the capital of the country of Bosnia and Herzegovina and its sub-entity, the Federation of Bosnia and Herzegovina, as well as of the Sarajevo Canton. It is also the de jure capital of another entity, Republika Srpska. Each of these levels of government has its parliament or council, as well as judicial courts, in the city. All national institutions and foreign embassies are in Sarajevo. Sarajevo is home to the Council of Ministers of Bosnia and Herzegovina, Parliamentary Assembly of Bosnia and Herzegovina, Presidency of Bosnia and Herzegovina, the Constitutional Court of Bosnia and Herzegovina and the operational command of the Armed Forces of Bosnia and Herzegovina. Bosnia and Herzegovina's Parliament office in Sarajevo was damaged heavily in the Bosnian War. Due to damage the staff and documents were moved to a nearby ground level office to resume the work. In late 2006, reconstruction work started on the Parliament and was finished in 2007. The cost of reconstruction is supported 80% by the Greek Government through the Hellenic Program of Balkans Reconstruction (ESOAV) and 20% by Bosnia-Herzegovina. The city comprises four municipalities Centar, Novi Grad, Novo Sarajevo, and Stari Grad. Each operate their own municipal government, united they form one city government with its own constitution. 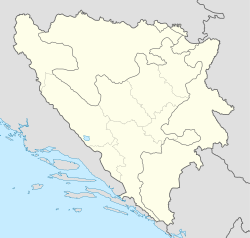 The executive branch (Bosnian: Gradska Uprava) consists of a mayor, with two deputies and a cabinet. The legislative branch consists of the City Council, or Gradsko Vijeće. The council has 28 members, including a council speaker, two deputies, and a secretary. Councilors are elected by the municipality in numbers roughly proportional to their population. The city government also has a judicial branch based on the post-transitional judicial system as outlined by the High Representative's "High Judicial and Prosecutorial Councils". Sarajevo's Municipalities are further split into "local communities" (Bosnian, Mjesne zajednice). Local communities have a small role in city government and are intended as a way for ordinary citizens to get involved in city government. They are based on key neighborhoods in the city. Sarajevo's large manufacturing, administrative, and tourism sectors make it the strongest economic region of Bosnia and Herzegovina. Indeed, Sarajevo Canton generates almost 25% of the country's GDP. After years of war, Sarajevo's economy saw reconstruction and rehabilitation programs. The Central Bank of Bosnia and Herzegovina opened in Sarajevo in 1997 and the Sarajevo Stock Exchange began trading in 2002. While Sarajevo had a large industrial base during its communist period, only a few pre-existing businesses have successfully adapted to the market economy. Sarajevo industries now include tobacco products, furniture, hosiery, automobiles, and communication equipment. Companies based in Sarajevo include BH Telecom, Bosnalijek, Energopetrol, Sarajevo Tobacco Factory, and Sarajevska Pivara (Sarajevo Brewery). In 2002 the total export for the greater Sarajevo region was worth about 259,569,000KM. Most of Sarajevo's exports (28.2%) head to Germany, with Great Britain following behind at 16.8% and Serbia and Montenegro third with 12.8%. The largest amount of imported goods come from Germany, at 15.8%. With a worth of total import at about 1,322,585,000KM, the total import is almost 5.1 times the total export. In 1981 Sarajevo's GDP per capita was 133% of the Yugoslav average. Gross pay in Sarajevo in February 2015 was KM 1,578 or €790, while net salary was KM 1,020 or €521. A panoramic view of Sarajevo from Koševsko Hill (Koševsko Brdo), summer 2010. Sarajevo has a wide tourist industry and a fast expanding service sector thanks to the strong annual growth in tourist arrivals. Sarajevo also benefits from being both a summer and winter destination with continuity in its tourism throughout the year. The travel guide series, Lonely Planet named Sarajevo as the 43rd best city in the world, and in December 2009 listed Sarajevo as one of the top ten cities to visit in 2010. In 2013 302.570 tourists visited Sarajevo, up 17.9% compared to 2012, giving 595.637 overnight stays, which is 18% more than in 2012. Sports-related tourism uses the legacy facilities of the 1984 Winter Olympics, especially the skiing facilities on the nearby mountains of Bjelašnica, Igman, Jahorina, Trebević, and Treskavica. Sarajevo's 600 years of history, influenced by both Western and Eastern empires, makes it a tourist attraction with splendid variations. Sarajevo has hosted travellers for centuries, because it was an important trading center during the Ottoman and Austria-Hungarian empires and because was a natural stop for many routes between East and West. Examples of popular destinations in Sarajevo include the Vrelo Bosne park, the Sarajevo cathedral, and the Gazi Husrev-beg's Mosque. Tourism in Sarajevo is chiefly focused on historical, religious, cultural sites and winter sports. Sarajevo is host to many parks throughout the city and on the outskirts of city. A popular activity among Sarajevo citizens is street chess, usually played at Trg oslobođenja Alija Izetbegović. Veliki Park is the largest green area in the center of Sarajevo. It's nestled between Titova, Koševo, Džidžikovac, Tina Ujevića and Trampina Streets and in the lower part there is a monument dedicated to the Children of Sarajevo. Hastahana is a popular place to relax in the Austro-Hungarian neighborhood of Marijin Dvor. Goat's Bridge, locally known as Kozija Ćuprija, in the Miljacka Canyon is also a popular park destination along the Dariva walkway and river Miljacka. On December 24 of 2012, a park hosting two brass sculptures resembling two mourning mothers was dedicated as the Friendship Park, commemorating over 45 years of friendship between Sarajevo and Baku. Sarajevo is also famous for its city lookouts; including an observation deck on Avaz Twist Tower, Park Prinčeva restaurant, Vidikovac lookout (Mt. Trebević), Zmajevac lookout and Yellow/White fortresses lookouts (in Vratnik) as well as numerous other rooftops throughout the city (i.e. Alta Shopping Center, BBI Center, Hotel Hecco Deluxe). The last official Yugoslav census took place 1991 and recorded 527,049 people living in the city of Sarajevo (ten municipalities). In the settlement of Sarajevo proper, there were 416,497 inhabitants. The war displaced hundreds of thousands of people, a large majority of whom have not returned. The first census since Bosnia and Herzegovina became an independent country was not taken until 2013 and as a result, for many years Sarajevo's population was not known clearly and statistics were based on estimates contributed by the United Nations Statistics Division and the Federal Office of Statistics of the Federation of Bosnia and Herzegovina, among other national and international non-profit organizations. As of June 2011[update], the population of the city's four municipalities was estimated to be 411,161, whereas the Sarajevo Canton population was estimated at 578,757. With an area of 1,280 square kilometres (490 sq mi), Sarajevo has a population density of about 2,173 inhabitants per square kilometre (5,630/sq mi). According to these estimates, the Novo Sarajevo municipality is the most densely populated part of Sarajevo with about 7,524 inhabitants per square kilometre (19,490/sq mi), while the least densely populated is the Stari Grad, with 2,742 inhabitants per square kilometre (7,100/sq mi). In June 2016, the final results of the 2013 census were published. According to the census, the population of the Sarajevo Canton was 413,593, with 55,181 residents in Centar Sarajevo, 118,553 in Novi Grad, 64,814 in Novo Sarajevo and 36,976 in Stari Grad. The war changed the ethnic and religious profile of the city. It had long been a multicultural city, and often went by the nickname of "Europe's Jerusalem". At the time of the 1991 census, 49.2 per cent of the city's population of 527,049 were Bosniaks, 29.8 percent Serbs, 10.7 percent Yugoslavs, 6.6 percent Croats and 3.6 percent other ethnicities (Jews, Romas, etc.). By 2002, 79.6 per cent of the canton's population of 401,118 were Bosniak, 11.2 percent Serb, 6.7 percent Croat and 2.5 percent others (Jews, Romas, Arabs, etc.). According to academic Fran Markowitz there is a number of "administrative apparatuses and public pressures that push people who might prefer to identify as flexible, multiply constituted hybrids or with one of the now unnamed minority groups into one of the three Bosniac-Croat-Serb constituent nations". These include respondents being encouraged by census interviewers to identity as belonging to one of the three constituent peoples. Her analysis of marriage registration data shows, for instance, that 67 per cent of people marrying in 2003 identified as Bosniak or Muslim, which is significantly lower than the 79.6 per cent census figure from 2002 (unlike the census, where people respond to an interviewer, applicants to the marriage registry fill in the form themselves). Sarajevo's location in a valley between mountains makes it a compact city. Narrow city streets and a lack of parking areas restrict automobile traffic but allow better pedestrian and cyclist mobility. The two main roads are Titova Ulica (Street of Marshal Tito) and the east-west Zmaj od Bosne (Dragon of Bosnia) highway (E761). Located roughly at the center of the country, Sarajevo is Bosnia's main intersection. The city is connected to all the other major cities by highway or national road like Zenica, Banja Luka, Tuzla, Mostar, Goražde and Foča. Tourists from Central Europe and elsewhere visiting Dalmatia driving via Budapest through Sarajevo also contribute to the traffic congestion in and around Sarajevo. The trans-European highway, Corridor 5C, runs through Sarajevo connecting it to Budapest in the north, and Ploče at the Adriatic sea in the south. The highway is built by the government and should cost 3.5 billion Euro. Up until March 2012, the Federation of Bosnia and Herzegovina invested around 600 million Euro in the A1. In 2014 the sections Sarajevo-Zenica and Sarajevo-Tarcin were completed including the Sarajevo Beltway ring road. Sarajevo's electric tramways, in operation since 1885, are the oldest form of public transportation in the city. Sarajevo had the first full-time (dawn to dusk) tram line in Europe, and the second in the world. Opened on New Year's Day in 1885, it was the testing line for the tram in Vienna and the Austro-Hungarian Empire, and operated by horses. Originally built to 760 mm (2 ft 5 15⁄16 in) Bosnian gauge, the present system in 1960 was upgraded to 1,435 mm (4 ft 8 1⁄2 in) standard gauge. The trams played a pivotal role in the growth of the city in the 20th century. There are seven tramway lines supplemented by five trolleybus lines and numerous bus routes. The main railroad station in Sarajevo is in the north-central area of the city. From there, the tracks head west before branching off in different directions, including to industrial zones in the city. Sarajevo is undergoing a major infrastructure renewal; many highways and streets are being repaved, the tram system is undergoing modernization, and new bridges and roads are under construction. To solve traffic congestion in the city, Sarajevo-based architect Muzafer Osmanagić has proposed a study called "Eco Energy 2010–2015", idealizing a subway system underneath the bed of the river Miljacka. The first line of Metro Sarajevo would connect Baščaršija with Otoka. This line would cost some 150 million KM and be financed by the European Bank for Reconstruction and Development. Trebević Cable Car, Sarajevo's key landmark during 1984 Winter Olympic Games, was rebuilt by JKP GRAS Sarajevo and Sarajevo Canton as one of the new transportation systems in 2017 and it reopened on 6 April 2018 at 11:00 AM. The cable car runs from Sarajevo at Bistrik station to the slopes of Trebević at Vidikovac station. Sarajevo International Airport (IATA: SJJ), also called Butmir, is just a few kilometers southwest of the city and was voted Best European Airport With Under 1,000,000 Passengers at the 15th Annual ACI-Europe in Munich in 2005. First regular flights to Sarajevo using an airfield in the suburb of Butmir begin in 1930 when the domestic airliner Aeroput opened a regular route linking Belgrade to Podgorica through Sarajevo. Later, Aeroput opened routed which linked Sarajevo with Split, Rijeka and Dubrovnik, and in 1938 first international flights were introduced when Aeroput extended the route Dubrovnik – Sarajevo – Zagreb to Vienna, Brno and Prague. The airfield in Butmir remained in use all the way until 1969. The need for a new airport in Sarajevo, with an asphalt-concrete runway, was acknowledged in the mid-1960s when JAT, Yugoslav national carrier at that time, began acquiring jet planes. The construction of the airport began in 1966 at its present location, not far from the old one. Sarajevo Airport opened on 2 June 1969 for domestic traffic. In 1970 Frankfurt became the first international destination served. Most of the time the airport was a 'feeder' airport where passengers embarked for flights to Zagreb and Belgrade on their way to international destinations. Over time the traffic volume steadily grew from 70,000 to 600,000 passengers a year. Later, during the Bosnian war, the airport was used for UN flights and humanitarian relief. 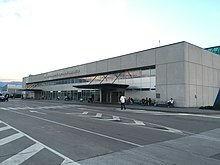 Since the Dayton Accord in 1996, the airport retook its role as main air gate to Bosnia and Herzegovina. In 2017, 957,971 passengers traveled through the airport, which was 61,4% of the total airport traffic in Bosnia-Herzegovina. Plans for extension of the passenger terminal, together with upgrading and expanding the taxiway and apron, are planned to start in fall 2012. The existing terminal will be expanded by approximately 7,000 square metres (75,347 square feet). The upgraded airport will also be directly linked to the commercial retail center Sarajevo Airport Center, making it easier for tourists and travellers to spend their time before flight boarding shopping and enjoying the many amenities that will be offered. Between 2015 and 2018 the airport will be upgraded for more than 25 million euros. Sarajevo has daily international connections which twice a day connect the city with Zagreb and Ploče. There are also connections between Sarajevo and all major cities within Bosnia and Herzegovina. Once, the East Bosnian railway connected Sarajevo to Belgrade. The Sarajevo railway station is among the biggest in Europe. Observation deck top of Avaz Twist Tower, Dnevni avaz headquarters. As the largest city of Bosnia and Herzegovina, Sarajevo is the main center of the country's media. Most of the communications and media infrastructure was destroyed during the war but reconstruction monitored by the Office of the High Representative has helped to modernize the industry as a whole. For example, internet was first made available to the city in 1995. Oslobođenje (Liberation), founded in 1943, is Sarajevo's longest running continuously circulating newspaper and the only one to survive the war. However, this long running and trusted newspaper has fallen behind Dnevni Avaz (Daily Voice), founded in 1995, and Jutarnje Novine (Morning News) in circulation in Sarajevo. Other local periodicals include the Croatian newspaper Hrvatska riječ and the Bosnian magazine Start, as well as weekly newspapers Slobodna Bosna (Free Bosnia) and BH Dani (BH Days). Novi Plamen, a monthly magazine, is the most left-wing publication. The Radiotelevision of Bosnia-Herzegovina is Sarajevo's public television station and was created in 1945 under the umbrella of the Yugoslav Radio Television. It had its first television program aired in 1961, while continuous programming started in 1969. It is one of three main TV stations in Bosnia and Herzegovina. Other stations based in the city include NRTV "Studio 99", NTV Hayat, TV 1, Open Broadcast Network, TV Kantona Sarajevo and Televizija Alfa. The headquarters of Al Jazeera Balkans are also in Sarajevo, with a broadcasting studio at the top of the BBI Center. The news channel covers Bosnia and Herzegovina, Serbia, Croatia and Montenegro and the surrounding Balkan states. Many small independent radio stations exist, including established stations such as Radio M, Radio Stari Grad (Radio Old Town), Studentski eFM Radio, Radio 202, Radio BIR, and RSG. Radio Free Europe, as well as several American and Western European stations are available. Higher education has a long and rich tradition in Sarajevo. The first institution that can be classified as a tertiary educational institution was a school of Sufi philosophy established by Gazi Husrev-beg in 1537; numerous other religious schools have been established over time. In 1887, under the Austro-Hungarian Empire, a Sharia Law School began a five-year program. In the 1940s the University of Sarajevo became the city's first secular higher education institute, effectively building upon the foundations established by the Saraybosna Hanıka in 1537. In the 1950s, post-bachelor graduate degrees became available. Severely damaged during the war, it was recently rebuilt in partnership with more than 40 other universities. There are also several international schools in Sarajevo, catering to the expatriate community; some of which are Sarajevo International School and the French International School of Sarajevo, established in 1998. Sarajevo has been home to many different religions for centuries, giving the city a range of diverse cultures. In the time of Ottoman occupation of Bosnia, Muslims, Serbian Orthodox, Roman Catholics, and Sephardi Jews all shared the city while maintaining distinctive identities. They were joined during the brief occupation by Austria-Hungary by a smaller number of Germans, Hungarians, Slovaks, Czechs and Ashkenazi Jews. By 1909, about 50% of the city's inhabitants were Muslim, 25% were Catholic, 15% were Orthodox, and 10% were Jewish. Historically, Sarajevo has been home to several prominent Bosnian poets, scholars, philosophers, and writers. To list only a very few; Nobel Prize-winner Vladimir Prelog is from the city, as are the writer Zlatko Topčić, and the poet Abdulah Sidran. Nobel Prize-winner Ivo Andrić attended high school in Sarajevo for two years. Academy Award-winning director Danis Tanović live in the city. Sarajevo is also the home of the East West Theatre Company, the only independent theater company in Bosnia and Herzegovina. The Sarajevo National Theatre is the oldest professional theater in Bosnia and Herzegovina, having been established in 1921. A panoramic view of the ruined castle of Bijela Tabija "White Bastion" in the very east of Sarajevo. The city is rich in museums, including the Museum of Sarajevo, the Ars Aevi Museum of Contemporary Art, Historical Museum of Bosnia and Herzegovina, The Museum of Literature and Theatre Arts of Bosnia and Herzegovina, and the National Museum of Bosnia and Herzegovina (established in 1888) home to the Sarajevo Haggadah, an illuminated manuscript and the oldest Sephardic Jewish document in the world issued in Barcelona around 1350, containing the traditional Jewish Haggadah, is on permanent display at the museum. It is the only remaining illustrated Sephardic Haggadah in the world. The National Museum also hosts year-round exhibitions pertaining to local, regional and international culture and history, and exhibits over 5,000 artefacts from Bosnia's history. 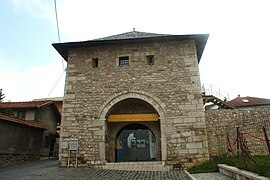 The Alija Izetbegović Museum was opened on 19 October 2007 and is in the old town fort, more specifically in the Vratnik Kapija towers Ploča and Širokac. The museum is a commemoration to the influence and body of work of Alija Izetbegović, the first president of the Republic of Bosnia and Herzegovina. The city also hosts the Sarajevo National Theater, established in 1919, as well as East West Theatre Company and the Sarajevo Youth Theatre. Some other cultural institutions include the Center for Sarajevo Culture, Sarajevo City Library, Art Gallery of Bosnia and Herzegovina, and the Bosniak Institute, a privately owned library and art collection focusing on Bosniak history. Demolitions associated with the war, as well as reconstruction, destroyed several institutions and cultural or religious symbols including the Gazi Husrev-beg library, the national library, the Sarajevo Oriental Institute, and a museum dedicated to the 1984 Winter Olympics. Consequently, the different levels of government established strong cultural protection laws and institutions. Bodies charged with cultural preservation in Sarajevo include the Institute for the Protection of the Cultural, Historical and Natural Heritage of Bosnia and Herzegovina (and their Sarajevo Canton counterpart), and the Bosnia and Herzegovina Commission to Preserve National Monuments. Sarajevo is and has historically been one of the most important musical enclaves in the region. The Sarajevo school of pop rock developed in the city between 1961 and 1991. This type of music began with bands like Indexi, Pro Arte, and singer-songwriter Kemal Monteno. It continued into the 1980s, with bands such as Plavi Orkestar, Crvena Jabuka, and Divlje Jagode, by most accounts, pioneering the regional rock and roll movement. Sarajevo was also the home and birthplace of arguably the most popular and influential Yugoslav rock band of all time, Bijelo Dugme, somewhat of a Bosnian parallel to the Rolling Stones, in both popularity and influence. 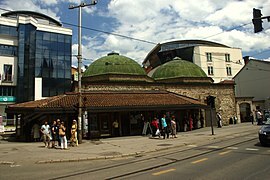 Sarajevo was also the home of a very notable post-punk urban subculture known as the New Primitives, which began during the early 1980s with the Baglama Band which was banned shortly after first LP and was brought into the mainstream through bands such as Zabranjeno Pušenje and Elvis J. Kurtović & His Meteors, as well as the Top Lista Nadrealista radio, and later television show. Other notable bands considered to be part of this subculture are Bombaj Štampa. Besides and separately from the New Primitives, Sarajevo is the hometown to one of the most significant ex-Yugoslavian alternative industrial-noise bands, SCH (1983–current). Perhaps more importantly, Sarajevo in the late 19th and throughout the 20th century was home to a burgeoning and large center of Sevdalinka record-making and contributed greatly to bringing this historical genre of music to the mainstream, which had for many centuries been a staple of Bosnian culture. Songwriters and musicians such as Himzo Polovina, Safet Isović, Zaim Imamović, Zehra Deović, Halid Bešlić, Hanka Paldum, Nada Mamula, Meho Puzić and many more composed and wrote some of their most important pieces in the city. Sarajevo also greatly influenced the pop scene of Yugoslavia with musicians like Dino Merlin, Hari Mata Hari, Tifa, Kemal Monteno, Željko Bebek, and many more. Many newer Sarajevo-based bands have also found a name and established themselves in Sarajevo, such as Regina who also had two albums out in Yugoslavia and Letu Štuke, who actually formed their band in Yugoslavia with the famous Bosnian-American writer Aleksandar Hemon and got their real breakthrough later in the 2000s. Sarajevo is now home to an important and eclectic mix of new bands and independent musicians, which continue to thrive with the ever-increasing number of festivals, creative showcases and concerts around the country. The city is also home to the region's largest jazz festival, the Sarajevo Jazz Festival (see "Festival" section below this). American heavy metal band Savatage, released a song entitled "Christmas Eve (Sarajevo 12/24)" on their 1995 album Dead Winter Dead, which was about a cello player playing a forgotten Christmas carol in war-torn Sarajevo. The song was later re-released by the same band under the name Trans-Siberian Orchestra on their 1996 debut album Christmas Eve and Other Stories, which the song gave them instant success. Sarajevo is internationally renowned for its eclectic and diverse selection of over 50 annual festivals. The Sarajevo Film Festival was established in 1995 during the Bosnian War and has become the premier and largest film festival in South-East Europe. It has been hosted at the National Theater, with screenings at the Open-air theater Metalac and the Bosnian Cultural Center, all in downtown Sarajevo. The MESS International Festival is an experimental theatre festival and the oldest living theatre festival in the Balkans. The annual Sarajevo Youth Film Festival showcases feature, animated and short films from around the world and is the premier student film festival in the Balkans. The Sarajevo Winter Festival, Sarajevo Jazz Festival and Sarajevo International Music Festival are well-known, as is the Baščaršija Nights festival, a month-long showcase of local culture, music, and dance. The first incarnation of the Sarajevo Film Festival was hosted in still-warring Sarajevo in 1995, and has now progressed into being the biggest and most significant festival in south-eastern Europe. A talent campus is also held during the duration of the festival, with lecturers speaking on behalf of world cinematography and holding workshops for film students from across South-Eastern Europe. The Sarajevo Jazz Festival is the region's largest and most diverse of its kind. The festival takes place at the Bosnian Cultural Center (aka "Main Stage"), just down the street from the SFF, at the Sarajevo Youth Stage Theater (aka "Strange Fruits Stage"), at the Dom Vojske Federacije (aka "Solo Stage"), and at the CDA (aka "Groove Stage"). Postage stamps depicting 1984 Winter Olympics in Sarajevo. Bosnian football player Edin Džeko was born in Sarajevo. He is the all-time leading goalscorer of the BiH national football team. Damir Džumhur, a Sarajevo born multi–Grand Slam tennis player. Asim Ferhatović Hase Stadium, home to FK Sarajevo, is largest stadium in Bosnia and Herz. The city hosted the 1984 Winter Olympics. Yugoslavia won one medal, a silver in men's giant slalom awarded to Jure Franko. Many of the Olympic facilities survived the war or were reconstructed, including Olympic Hall Zetra and Asim Ferhatović Stadion. In an attempt to bring back some of Sarajevo's Olympic glory, the original Olympic luge and bobsled tracks are being repaired, due to the efforts of both the Olympic Committee of Bosnia and Herzegovina and local sports enthusiasts. After co-hosting the Southeast Europe Friendship games, Sarajevo was awarded the 2009 Special Olympic winter games, but cancelled these plans. The ice arena for the 1984 Olympics, Zetra Stadium, was used during the war as a temporary hospital and, later, for housing NATO troops of the IFOR. In 2011 Sarajevo was the host city of the 51st World Military Skiing Championship with over 350 participants from 23 different nations. This was the first international event of such standing since the 1984 Olympics. Football (soccer) is popular in Sarajevo; the city hosts FK Sarajevo and FK Željezničar, which both compete in European and international cups and tournaments and have a very large trophy cabinet in the former Yugoslavia as well as independent Bosnia and Herzegovina. Other notable soccer clubs are FK Olimpik, SAŠK and Slavija. The only stadium in Bosnia and Herzegovina that has UEFA category 3 is the Stadion Grbavica, stadium of FK Željezničar. Another popular sport is basketball; the basketball club KK Bosna Sarajevo won the European Championship in 1979 as well as many Yugoslav and Bosnian national championships making it one of the greatest basketball clubs in the former Yugoslavia. The chess club, Bosna Sarajevo, has been a championship team since the 1980s and is the third ranked chess club in Europe, having won four consecutive European championships in the nineties. RK Bosna also competes in the European Champions League and is considered one of the most well organised handball clubs in South-Eastern Europe with a very large fan base and excellent national, as well as international results. Sarajevo often holds international events and competitions in sports such as tennis and kickboxing. The popularity of tennis has been picking up in recent years. Since 2003, BH Telecom Indoors is an annual tennis tournament in Sarajevo. Since 2007, the Sarajevo Marathon is being organized in late September. Giro di Sarajevo is also run in the city with over 2,200 cyclists taking part in 2015. In 2019, Sarajevo and East Sarajevo will host the European Youth Olympic Winter Festival (EYOWF). a.^ Sarajevo metropolitan area includes Sarajevo Canton with 413,593 inhabitants, East Sarajevo with 61,516 inhabitants as well as municipalities of Breza (14,564), Kiseljak (21,919), Kreševo (5,638) and Visoko (41,352). ^ a b c Stilinovic, Josip (3 January 2002). "In Europe's Jerusalem", Catholic World News. The city's principal mosques are the Gazi Husrev-Bey's Mosque, or Begova Džamija (1530), and the Mosque of Ali Pasha (1560–61). Retrieved on 5 August 2006. ^ a b Benbassa, Esther; Attias, Jean-Christophe (2004). The Jews and their Future: A Conversation on Judaism and Jewish Identities. London: Zed Books. p. 27. ISBN 978-1-84277-391-8. ^ a b "Visit Sarajevo: A Brief History of the City". Visit Sarajevo. Archived from the original on 23 August 2011. Retrieved 28 March 2012. ^ a b Census 2013th official data. ^ "Wayback Machine" (PDF). 2015-09-06. Archived from the original (PDF) on 2015-09-06. Retrieved 2018-08-14. ^ Toe, Rodolfo (1 July 2016). "Census Results Highlight Impact of Bosnian War". Balkan Transitional Justice. Balkan Investigative Reporting Network. Retrieved 14 October 2017. ^ "Sarajevo: The economic, administrative, cultural and educational center of Bosnia and Herzegovina". Mediterranea News. 12 May 2011. Archived from the original on 24 April 2012. Retrieved 5 April 2012. ^ daenet d.o.o. "Sarajevo Official Web Site : Economy". Sarajevo.ba. Retrieved 5 April 2012. ^ Malcolm, Noel (1996). Bosnia: A Short History [Paperback]. London: NYU Press. pp. 107, 364. ISBN 978-0-8147-5561-7. ^ Agency, Anadolu. "Saraybosna'da 476 yıldır yaşayan medrese! (Sarajevo Celebrates 476 Years of its Medresa!)". Haber7. Retrieved 11 November 2013. ^ "Things to do in Sarajevo". Gezip Gördüm. 2018-08-28. Retrieved 11 November 2013. ^ Valerijan, Žujo; Imamović, Mustafa; Ćurovac, Muhamed. Sarajevo. ^ a b Lonely Planet: Best Cities in the World. Lonely Planet. ISBN 978-1-74104-731-8. ^ Connelly, Charlie (8 October 2005). "The New Siege of Sarajevo". The Times. UK. Retrieved 10 May 2010. ^ Kelley, Steve. "Rising Sarajevo finds hope again", The Seattle Times. Retrieved on 19 August 2006. ^ a b Lonely Planet (March 2006). The Cities Book: A Journey Through The Best Cities In The World, Lonely Planet Publications, ISBN 1-74104-731-5. ^ a b "Lonely Planet's Top 10 Cities 2010 | Lonely Planet's Top 10 Cities 2010". News.com.au. Archived from the original on 10 October 2010. Retrieved 19 January 2010. ^ "Nomination of Sarajevo for European Capital of Culture 2014". BH-News.com. Retrieved 15 September 2011. ^ "Sarajevo: With Sarajevo as Europe's Capital of Culture 2014 we could send an... – 12/05/2011 – EPP Group". Group of the European People's Party (Christian Democrats) in the European Parliament. Retrieved 15 September 2011. ^ Ronelle Alexander (Aug 15, 2006). Bosnian, Croatian, Serbian, a Grammar: With Sociolinguistic Commentary. Univ of Wisconsin Press. p. 2. ISBN 9780299211936. ^ Hazim Šabanović (1959). Bosanski pašaluk: postanak i upravna podjela (in Serbo-Croatian). Naučno društvo NR Bosne i Hercegovine. pp. 28–37. UDC 94(497.6)"14/17". Retrieved 11 September 2012. ^ "Google Translate". Retrieved 25 September 2014. ^ Longoria 2007, p. 272. ^ "About Sarajevo – Official Sarajevo statistics". sarajevo.ba. 6 September 2015. ^ "Vrelo Miljacke – sramota za turizam RS i BiH". draganmocevic.com. 23 December 2013. ^ Lacan, Igor; McBride, Joe R. (2009). "War and trees: The destruction and replanting of the urban and peri-urban forest of Sarajevo, Bosnia and Herzegovina". Urban Forestry & Urban Greening. 8 (3): 133–148 . doi:10.1016/j.ufug.2009.04.001. ^ "Weatherbase: Historical Weather for Sarajevo, Bosnia and Herzegovina". Weatherbase. Retrieved 17 April 2013. ^ "Weather and Climate: The Climate of Sarajevo" (in Russian). Weather and Climate (Погода и климат). Archived from the original on May 16, 2012. Retrieved August 25, 2016. ^ "Sarajevo Climate Normals 1961–1990". National Oceanic and Atmospheric Administration. Retrieved August 25, 2016. ^ "Air Pollution is Choking Bosnia, Experts Warn :: Balkan Insight". www.balkaninsight.com. Retrieved 2017-04-04. ^ "Bosnia: Sarajevo schools close down because pollution". Mail Online. Retrieved 2017-04-04. ^ "Sarajevo introduces transport restrictions to ease pollution". Fox News. 2016-12-26. Retrieved 2017-04-04. ^ "WHO Global Urban Ambient Air Pollution Database (update 2016)". World Health Organization. Retrieved 2017-04-04. ^ "Ambient (outdoor) air quality and health". World Health Organization. Retrieved 2017-04-04. ^ Group, US EPA National Center for Environmental Assessment, Research Triangle Park Nc, Environmental Media Assessment; Sacks, Jason. "Integrated Science Assessment (ISA) for Particulate Matter (Final Report, Dec 2009)". cfpub.epa.gov. Retrieved 2017-04-04. ^ "Federalni hidrometeorološki zavod". www.fhmzbih.gov.ba. Retrieved 2017-04-04. ^ "The Culture & History", Tourism Association of Sarajevo Canton, Retrieved on 3 August 2006. ^ "Commission to preserve national monuments". 2007-10-13. Archived from the original on 2007-10-13. Retrieved 2018-08-14. ^ a b c "Sarajevo", New Britannica, volume 10, edition 15 (1989). ISBN 0-85229-493-X. ^ Belgradenet.com. "The History of Belgrade: Middle Ages - Turkish Conquest - Liberation of Belgrade". www.belgradenet.com. ^ "Baščaršija". bloger.hr. Retrieved 24 September 2015. ^ "BH Tourism – History". ^ FICE (International Federation of Educative Communities) Congress 2006. Sarajevo – History. [dead link] Congress in Sarajevo. Retrieved on 3 August 2006. 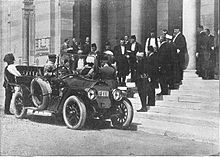 ^ "Archduke Franz Ferdinand assassinated – Jun 28, 1914 – HISTORY.com". history.com. ^ Times, Los Angeles. "Timeline: A short history of Sarajevo and region". latimes.com. ^ Donia, Robert J. (2006). Sarajevo: A Biography. University of Michigan Press. pp. 240–241. ISBN 978-0-472-11557-0. ^ Sachs, Stephen E. (1994). Sarajevo: A Crossroads in History. Retrieved on 3 August 2006. ^ "Sarajevo Red Line – 1154" (in Bosnian). City.ba. 4 April 2012. ^ "Red Line for the victims of the Siege of Sarajevo" (in Bosnian). E-News. 4 April 2012. Archived from the original on 1 July 2012. ^ a b Bassiouni, Cherif (27 May 1994). "Final report of the United Nations Commission of Experts established pursuant to security council resolution 780". United Nations. Archived from the original on 2 March 2014. Retrieved 10 May 2010. ^ Hartmann, Florence (July 2007). "A statement at the seventh biennial meeting of the International Association of Genocide Scholars". Helsinki. Archived from the original on 22 September 2011. Retrieved 11 May 2010. ^ a b Strange, Hannah (12 December 2007). "Serb general Dragomir Milosevic convicted over Sarajevo siege". The Times. UK. Retrieved 10 May 2010. ^ "Sarajevo". TripAdvisor. Sarajevo, Bosnia and Herzegovina. Retrieved 5 January 2015. ^ "Constitution of the Republika Srpska". Official Web Site of the Office of the High Representative. Retrieved 6 August 2017. ^ "Sarajevo's economic standpoint in Bosnia and Herzegovina" (PDF). Canton of Sarajevo. 12 February 2016. Retrieved 12 February 2016. ^ European Commission & World Bank. "The European Community (EC) Europe for Sarajevo Programme". Archived from the original on 6 November 2007. Retrieved 2006-07-26. CS1 maint: BOT: original-url status unknown (link) The EC reconstruction programme for Bosnia and Herzegovina detailed by sector. Retrieved on 5 August 2006. ^ Radovinović, Radovan; Bertić, Ivan, eds. (1984). Atlas svijeta: Novi pogled na Zemlju (in Croatian) (3rd ed.). Zagreb: Sveučilišna naklada Liber. ^ "Kanton Sarajevo: Više turista u 2011". Vijesti.ba. Retrieved 2013-03-12. ^ "Statistički Godišnjaci/Ljetopisi". Fzs.ba. Retrieved 2013-03-12. ^ "Hastahana – Skate & relax". spottedbylocals.com. Retrieved 7 September 2015. ^ "Dariva". sarajevo.travel/ba. Retrieved 19 September 2015. ^ "Kozija ćuprija". sarajevo.travel/ba. Retrieved 19 September 2015. ^ Population density and urbanization. Retrieved on 5 August 2006. ^ "First release" (PDF). Federal Office of Statistics, Federation of Bosnia and Herzegovina. 31 August 2011. p. 3. Archived from the original (PDF) on 11 May 2013. Retrieved 31 August 2011. ^ "Census of population, households and dwellings in Bosnia and Herzegovina, 2013: Final results" (PDF). Agency for Statistics of Bosnia and Herzegovina. June 2016. Retrieved 6 July 2016. ^ Bureau of Democracy, Human Rights, and Labor, US Department of State. Bosnia and Herzegovina International Religious Freedom Report 2005. Retrieved on 5 August 2006. ^ "Сараево преплавено со Вехабии, преселени над 40 илјади". Faktor.mk. 3 September 2016. Retrieved on 19 June 2018. ^ Markowitz 2010, p. 83. ^ Markowitz 2007, p. 57. ^ Markowitz 2007, p. 69. ^ Corridor 5C. Retrieved on 5 August 2006. ^ Akta.ba. "404". www.akta.ba. Archived from the original on 18 November 2010. Retrieved 24 September 2015. ^ "EX-YU aviation news: Sarajevo expansion to begin in 2012". Exyuaviation.blogspot.com. 17 September 2011. Retrieved 5 April 2012. ^ "A new shopping experience in Sarajevo!". Airportcentersarajevo.com. Retrieved 5 April 2012. ^ a b c d e f g h i j daenet d.o.o. "Sarajevo Official Web Site : Sister cities". Sarajevo.ba. Archived from the original on 12 April 2009. Retrieved 6 May 2009. ^ "Medmestno in mednarodno sodelovanje". Mestna občina Ljubljana (Ljubljana City) (in Slovenian). Archived from the original on 26 June 2013. Retrieved 2013-07-27. ^ "Official portal of City of Skopje – Skopje Sister Cities". City of Skopje. Archived from the original on 24 October 2013. Retrieved 14 July 2009. ^ "Fraternity cities on Sarajevo Official Web Site". City of Sarajevo 2001–2008. Archived from the original on 1 December 2008. Retrieved 9 November 2008. ^ "Sister Cities of Istanbul". Retrieved 8 September 2007. ^ "Budapest – Testvérvárosok" [Budapest – Twin Cities]. Budapest Főváros Önkormányzatának hivatalos oldala [Official site of the Municipality of Budapest] (in Hungarian). Archived from the original on 9 August 2013. Retrieved 2013-08-14. ^ "Coventry – Twin towns and cities". Coventry City Council. Archived from the original on 12 April 2013. Retrieved 2013-08-06. ^ Griffin, Mary (2011-08-02). "Coventry's twin towns". Coventry Telegraph. Archived from the original on 6 August 2013. Retrieved 2013-08-06. ^ "Official agreement paper between Sarajevo and Madrid (Spanish and Bosnian languages)" (PDF). Archived from the original (PDF) on 21 October 2013. ^ "Official Barcelona Website: Sister Cities". Ajuntament de Barcelona 1995–2008. Archived from the original on 16 February 2009. Retrieved 11 November 2008. ^ European Journalism Centre (November 2002). The Bosnia-Herzegovina media landscape. Archived 15 April 2013 at the Wayback Machine European Media Landscape. Retrieved on 5 August 2006. ^ Vockic-Avdagic, Jelenka. The Internet and the Public in Bosnia-Herzegovina in Spassov, O., and Todorov Ch. (eds.) (2003), New Media in Southeast Europe. SOEMZ, European University "Viadrina" (Frankfurt – Oder) and Sofia University "St. Kliment Ohridski". ^ "Al Jazeera makes its Balkan debut | Europe | Deutsche Welle | 22 September 2010". Deutsche Welle. Retrieved 15 September 2011. ^ "eFM – Naslovnica". efm.ba. Retrieved 24 September 2015. ^ "Radio BIR". Bir.ba. Retrieved 5 April 2012. ^ Sarajevo Canton, 2000 "Primary Education & Secondary Education" (PDF). Archived from the original (PDF) on 22 November 2009. (1.28 MB). Sarajevo 2000, p 107–08. ^ "Ecole française MLF de Sarajevo : News". École française MLF de Sarajevo. Archived from the original on 24 February 2010. Retrieved 19 January 2010. ^ "Sarajevo.net Museum: The Sarajevo Haggadah". Archived from the original on 25 April 2010. Retrieved 13 April 2016. ^ "Haggadah.ba – About the Sarajevo Haggadah". Haggadah.ba. Retrieved 28 March 2012. ^ Perlez, Jane (12 August 1996). Ruins of Sarajevo Library Is Symbol of a Shattered Culture The New York Times. ^ a b "About the Festival". Sarajevo Film Festival Official Website. ^ "MESS International Theatre Festival". befestival.org. ^ "Omladinski filmski festival Sarajevo predstavlja nove mlade autore". Al Jazeera Balkans. 2017-07-04. ^ "Sarajevo Film Festival — Filmski Festivali — Filmski.Net". Filmski.net. Retrieved 1 November 2008. ^ "FIFA.com: Edin DZEKO Profile". fifa.com. 15 June 2014. Retrieved 17 June 2014. ^ markbooth_mcfc (21 August 2014). "Dzeko signs four-year deal at City". mcfc.co.uk. Manchester. Retrieved 21 August 2014. ^ "Olimpijski stadion Asim Ferhatović – Hase". rekreacija.ba. Retrieved 24 September 2015. ^ IOC (2006). Jure Franko Athlete: Profiles. Retrieved on 5 August 2006. ^ Return the Olympics to Sarajevo. [returntheolympicstosarajevo.org] Retrieved on 26 January 2017. ^ Winter Olympic host city Sarajevo to stage course for luge trainers. Retrieved on 26 January 2017. ^ Sports enthusiasts repair devastated Winter Olympic tracks  Retrieved on 26 January 2017. ^ Special Olympics, (2005 – Quarter 2). "2009 Games in Sarajevo" (PDF). Archived from the original (PDF) on 26 March 2009. (277 kB) Spirit. Retrieved on 5 August 2006. ^ Hem, Brad (29 July 2006). Idaho may be in the running to host the 2009 Special Olympics[dead link] Idaho Statesman. ^ Special Olympics (May 2006). Boise, Idaho (USA) Awarded 2009 Special Olympics World Winter Games Archived 1 January 2016 at the Wayback Machine Global News. ^ Phone Web (9 June 2011). "CISM — Conseil International du Sport Militaire — International Military Sports Council". www.keezmovies.com. Retrieved 15 September 2011. ^ klix.ba (6 September 2015). "Giro di Sarajevo via drone". klix.ba. Retrieved 6 September 2015. Bollens, Scott A. (2007). Cities, Nationalism, and Democratization. Abingdon: Routledge. ISBN 978-0-415-41947-5. Gumz, Jonathan (1998). "German Counterinsurgency Policy in Independent Croatia, 1941–1944". The Historian. 61 (1): 33–50. doi:10.1111/j.1540-6563.1998.tb01422.x. Tanzer, Kim; Longoria, Rafael (11 April 2007). The Green Braid: Towards an Architecture of Ecology, Economy and Equity. Routledge. ISBN 978-1-134-12058-1. Markowitz, Fran (2007). "Census and sensibilities in Sarajevo". Comparative Studies in Society and History. 49 (1): 40–73. doi:10.1017/S0010417507000400. Markowitz, Fran (2010). Sarajevo: A Bosnian Kaleidoscope. Urbana, IL: University of Illinois Press. ISBN 978-0-252-07713-5.